Today, marks the new year on the Jewish Calendar. On Rosh Hashaha, we celebrate having a sweet year by eating apples and honey. This year, we’ll be eating plenty of that since B and JSL picked 19.5 pounds of apples! 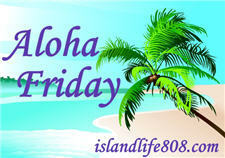 My Aloha Friday question for today is: What is your favorite recipe to make with apples? Good old apple pie. Yum. Auntie E recently posted..Aloha Friday…..Favorite Kitchen Gadget. I’m actually not a big fan of apples. I guess my favorite “apple” thing would be hot apple cider. I’m happy with peanut butter on apples.